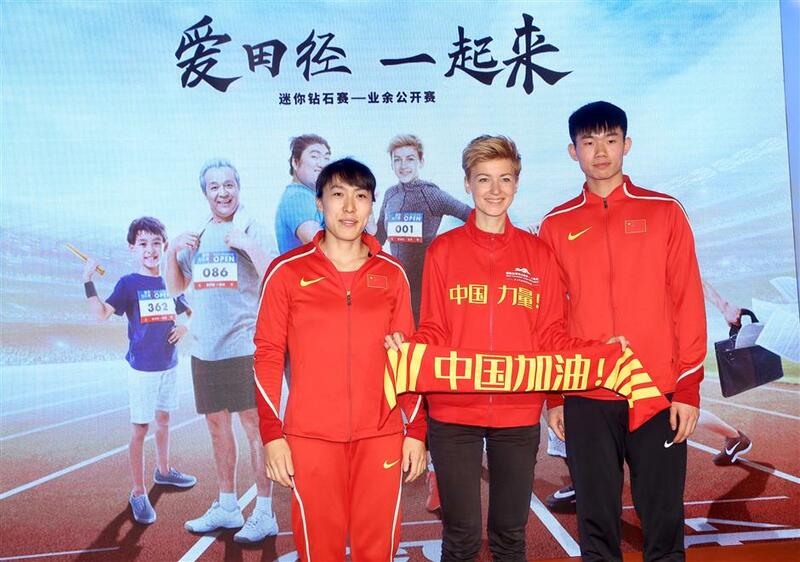 Chinese javelin thrower Lu Huihui (left) and student hurdler Zeng Jianhang (right) pose with an amateur athlete, who will take part in the “mini diamond league”, at a promotional event for the 2019 IAAF Diamond League in Shanghai on Thursday. The 2019 IAAF Diamond League will be held at Shanghai Stadium on May 18. Sprinter Su Bingtian will lead the Chinese squad in the 10th edition of the annual track and field competition. The first batch of athletes confirmed for this year's Shanghai leg was announced by organizers on Thursday, and it included names like Russian world champion hurdler Sergey Shubenkov and Rio Olympics long jump silver medalist Luvo Manyonga from South Africa. Su, the co-holder of the 100-meter Asian record, will be the home favorite at Shanghai Stadium. Standing together with him on the track will be American Christian Coleman, the 100 and 200 double silver medalist at the 2017 world championships. Other Chinese athletes confirmed for the home event include shot putter Gong Lijiao, the 2017 world champion and 2012 Olympics silver medalist, as well as long jumper Wang Jianan, high jumper Wang Yu and javelin thrower Lu Huihui. The meet will have 16 events — nine for men (100 meters, 200, 400, 5,000, 110 hurdles, 400 hurdles, high jump, long jump, and javelin) and seven for women (100, 400, 1,500, 3,000 steeplechase, pole vault, shot put, and javelin). Shanghai first hosted the IAAF Golden League in 2005. In 2010, the event was upgraded to Diamond League. To mark the 10th anniversary of the upgrade, a "mini diamond league" will be organized for more than 800 amateur athletes on May 11 at Shanghai University of Sport. Top finishers will take part in warm-up competitions at Shanghai Stadium before the start of the main meet. Tickets for the 2019 Diamond League Shanghai leg are available at www.jusstickets.com. Chinese sprint sensation Su Bingtian is set to clash with heavy competition when he bids to regain his 100m crown at the 2019 Shanghai Diamond League.